Mount Fuji is divided into ten stations with the first station at the foot of the mountain and the tenth being the summit. Taking the Keio highway bus that goes from the Shinjuku station in Tokyo to the Kawaguchiko 5th station for a round trip cost of 5200 yen, we knew it was going to be a tough one as we were heading for an overnight hike on a Friday evening straight from the office after a week-long of work. Listening to stories by our Guido-san @revant12 about Mt. Fuji being an active volcano which could erupt and turn the mountain into a disaster zone, we got off at the Kawaguchiko 5th station at 21:50 and spent some time at the considerably overpriced shops at the station to acclimatize to the altitude of 2305m and the cold climate. 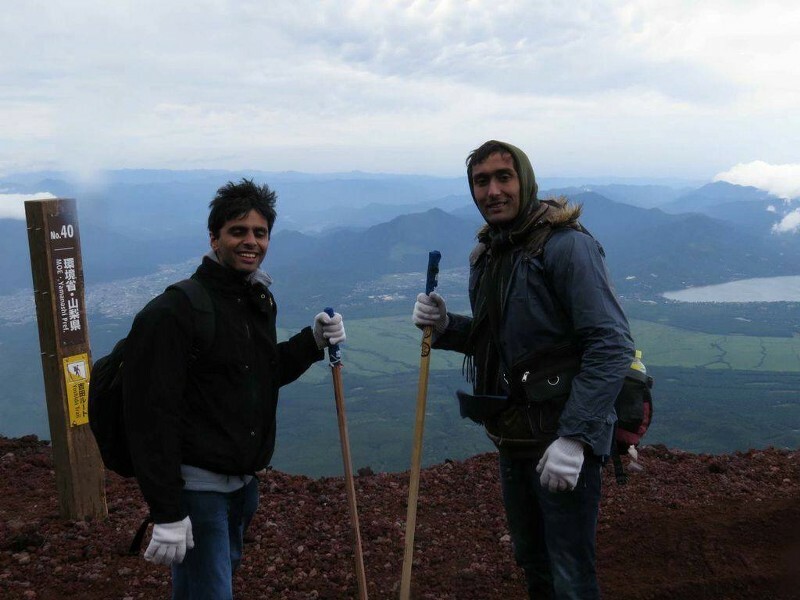 Being inexperienced climbers and unaccompanied by a guide, we planned to climb up the Yoshida trail from the Kawaguchiko 5th Station in Yamanashi Prefecture as that is the most popular base for the climb to the summit, and the most easily accessible station from Tokyo. Also Yoshida is along the east side of the mountain, giving us a chance to witness the sunrise just in case we do not make it to the summit by sunrise. 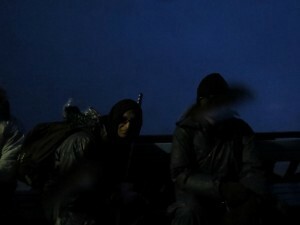 Standing at the altitude of about 2300 meters with all logistics taken care of, we began our overnight trek at 21:15. None of us was experienced in overnight hiking and the trails were not equipped with street lights so we could barely see anything and tried to stay away from the edges. 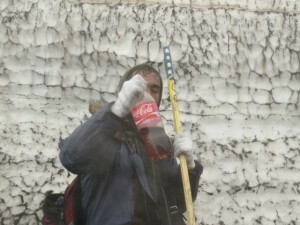 We were advised not to climb too fast to guard against altitude sickness. On one hand, I and a couple of others were were concerned about missing the sunrise from the summit at the pace we were advancing. On the other hand, one of our friends realized climbing 3776 meters on that rocky terrain is not something he would risk doing without prior training given that he had recently recovered from a back ache. With our limited Japanese skills and sign-language, we asked for directions to a nearby mountain hut, where one can stay for the night and get food by paying a sum of 5500 yen. Ashwin and I helped him to the off route mountain hut while the others waited at the station costing us an additional 40 minute delay and a lot of fatigue. As we moved on, it became really cold with heavy downpour. Some of us were more tired than the others. This is when we decided it would be best to split into sub groups. Our sub-group was of 4 people with only one headlight. As I was wearing the headlight, I climbed a few steps on the rocky terrain, then turning back to help others with the lights. 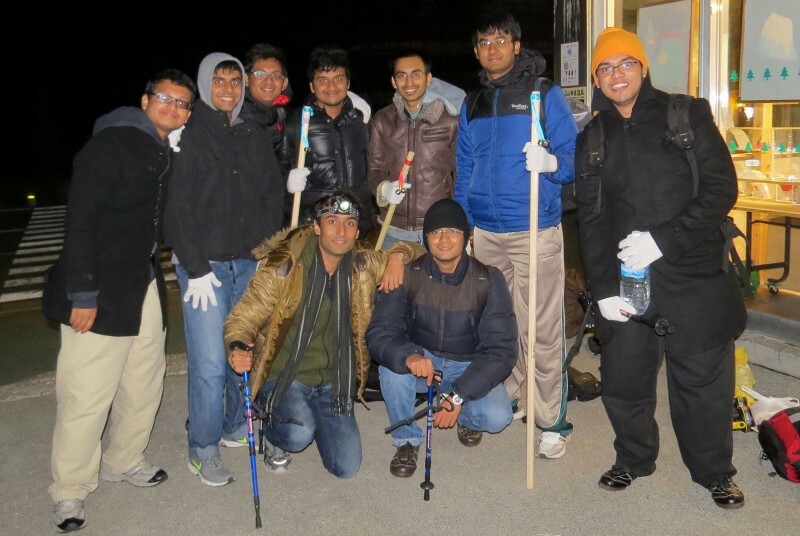 We continued this exercise for about couple of hours making our way to the 8th station at 3:02am where we decided to rest for a few minutes. 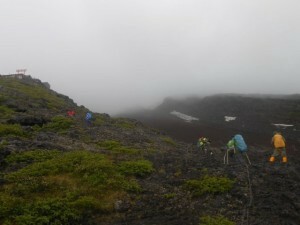 While we decided to rest for a bit, we met our other group and before we could head further, the weather turned worse. Continuing the climb was discouraged by the locals so we decided to extend our stop for a few more minutes, catch our breath, have snickers and decide what to do next. My motivational speeches about climbing Mt. 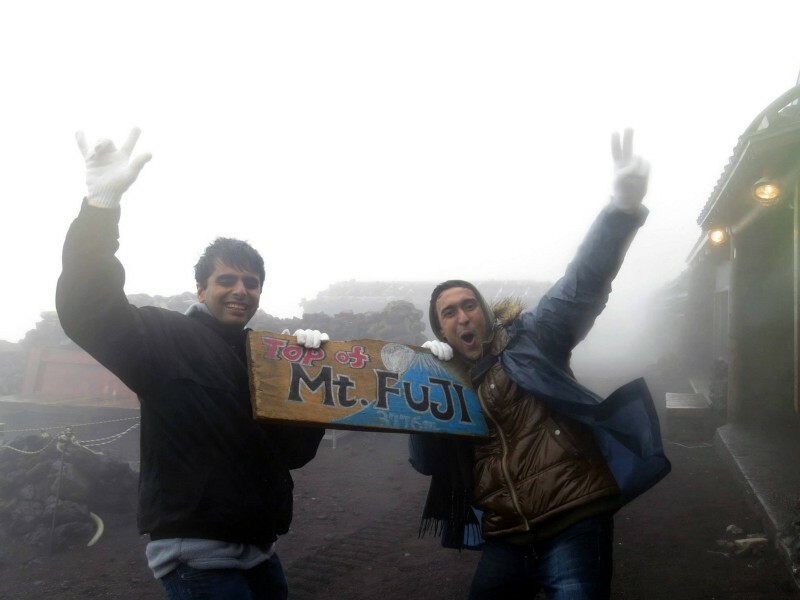 Fuji is a once in a lifetime opportunity were getting nullified by the bunch of localities climbing down due to the bad weather. It was almost dawn and we could not make a decision, so we stayed to wait for the what turned out to be the most spectacular sunrise over the clouds from the land of the rising sun. Within minutes the sun was shining giving the most breathtaking view of the Yamanashi prefecture and the Fuji five lakes over the clouds. The hike appeared never ending and the weather continued to remain bad so 6 of my friends deciding to join the locals on their way back to the base station, leaving me and Jinit for rest of the trek. As we moved ahead, I began to feel the air was significantly thinner as we began to get tired noticeably quicker than before. Being a volcanic mountain, the terrain was progressively steeper and rockier as we stepped closer to the summit. 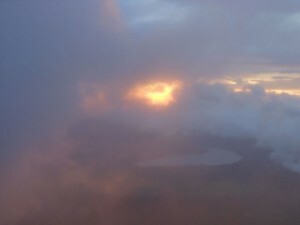 The summit looked almost unreachable due to the worsening weather. The view from the 9th station at 3600m was all white. For most of the time now, we were climbing with our hands reaching the 9th station with torn raincoats, soaked jackets and frozen fingers. Reaching so far, we were determined to continue, had a quick bite of energy bars and managed to reach the top of Mt. Fuji! At this point it was difficult to see beyond a few feet because of the extreme rain and fog. For a moment, the thrill of standing at the top of an active volcano made me completely forget the cold. 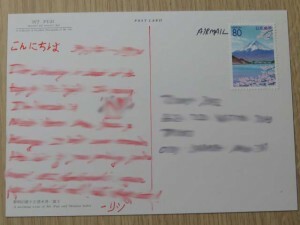 I took off my gloves and started walking around to find the post office to send postcards to friends when we found out that it was closed due to the unforeseen weather. As I sat down to rest, my body temperature dropped significantly and I could not feel my fingers anymore. At the wind speed of 55km/hr. and a temperature lesser than 0 degree Celsius, it was enough to cause Hypothermia in the absence of proper winter gear. Within seconds, I went into a power nap of 10 odd minutes which felt like a hibernation of a few days. After getting the customary sunrise stamp bearing the hiking date on our hiking poles we started to prepare ourself for the descend which was tougher than what it appeared. A sudden gust of wind took away a torn piece of my raincoat making it disappear before I could blink. This was the first time during the hike I was actually scared. This is when I asked Jinit to take a break as I needed time to gather courage. We stopped for a few minutes along the snowy path to heat up our freezing bodies with a bottle of brandy. 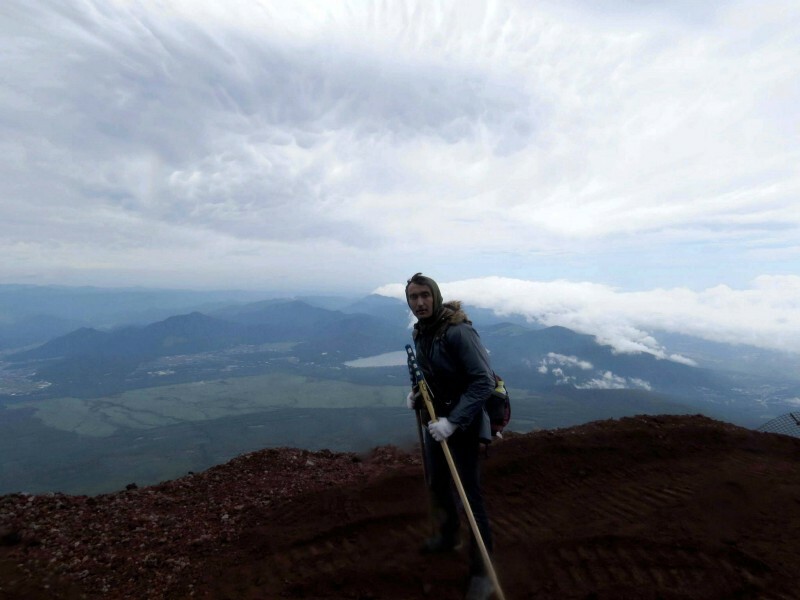 The downward path was composed of tiny volcanic rocks and ash, which combined with the slope and the strong wind, made walking down without slipping a few times impossible. As we moved ahead, patches of the trail were muddy and slippery due to the overnight rain. On one of these patches, I slipped and my toe nail came off. We had read when strong winds had literally blowing climbers off the Mt. Fuji slopes and of tents flying off with climbers in them. It was hard to believe until we experienced the wind. I was not an experienced climber back then. Jinit, who had completed a hiking course was much better at maintaining his balance and he helped me through the downclimb. Once we were below the clouds, the view down the trek was so clear and amazing that both of us decided to take long breaks at various places to enjoy some of the best views that we had ever seen. Finally reaching the base station in the afternoon, we rushed to buy a few souvenirs and post the cards from the base station post office that we couldn’t send from the summit before taking the return bus to Tokyo. On a clear day, no section of the climb is impossible for a person with reasonable physical fitness. A lot of blogs mention that the challenge of climbing Mt. 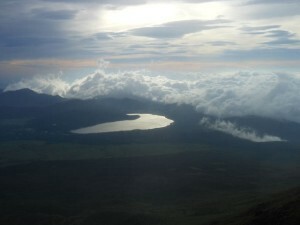 Fuji comes from the sheer, strenuous extent of it and requires a lot of stamina. Also there are lots of posts about altitude sickness, accidents happening when people are climbing or descending the mountain at night and the avalanches due to the steep slope and lack of vegetation. Yes, Fuji does kill people but only if you approach it unprepared. We all went in with a lot of preparations and all the 9 of us made back our way to Tokyo without suffering any major injuries. The weather does change very quickly. Only if you decide to climb during rains, you will be reminded at every step that man is mortal, when ascending in the darkness with rain making your way up slippery, or when descending against the headwind. However, the memories and the thrill make the climb more worth than the risk and the journey a memory of a lifetime!